The Wasp shows that Marvel really does understand female superheroes better than anyone and gives Lilly the chance to shine. Made for mCU fans and anyone looking for some genuine laughs and thrills. If there’s one thing we can count on in the Marvel Cinematic Universe, it’s quality. Ant-Man and the Wasp may be their 20th film — and their fourth release since November — but Kevin Feige has made sure the MCU does not suffer from burnout. Returning director Peyton Reed ups the ant-e, delivering one of Marvel’s — and the year’s — funniest movies. Having star Paul Rudd credited as co-writer probably helped. But they also understand that the Ant-Man films are different from the rest of the MCU. They are now the heart and soul of the franchise and prove that it takes far more than superpowers to be a superhero. Two years after the Leipzig/Halle Airport incident, Scott Lang (Rudd) is finally seeing the light at the end of his house arrest. Scott spends his days entertaining his daughter Cassie (Abby Ryder Fortson) when he’s not being harassed by FBI agent Jimmy Woo (Randall Park). Meanwhile, Hank Pym (Michael Douglas) and Hope Van Dyne (Evangeline Lilly) are trying to build a quantum tunnel to find Janet Van Dyne (Michelle Pfeiffer), whom Hank believes is still alive. Meanwhile, the mysterious Ghost (Hannah John-Kamen) is trying to steal the quantum tunnel to use it to save herself after an incident as a child caused her to be in an unstable quantum form. Now, Scott, Hope, and Hank must let go of the past to make sure that they all still have a future. It will always be a shame that we never got to see Edgar Wright’s version of Ant-Man, but the franchise continues to be in safe hands with Reed. Keeping things on a personal scale is far more effective than finding Ant-Man battling it out with another flavor-of-the-week supervillain. Ghost is a fantastic enemy for the team to duke it out with since all she wants to do is get herself back to normal. Even if it means possibly tearing Janet apart from the quantum realm. It’s usually never a good sign when a film has five credited writers — Chris McKenna, Erik Sommers, Andrew Barrer, and Gabriel Ferrari join Rudd — but Ant-Man and the Wasp delivers in spades. The action is bigger, the jokes are funnier, the pace is faster, the villain is cooler. It’s everything you could want in a Marvel sequel. A particular episode with Scott having to visit Cassie’s school is one of the funniest sequences in years. Ranks on par with Deadpool’s baby legs. Also, Lilly and John-Kamen make terrific asskickers! Wasp is a superhero to be reckoned with no matter what size she is. And the daddy/daughter scenes are too precious. 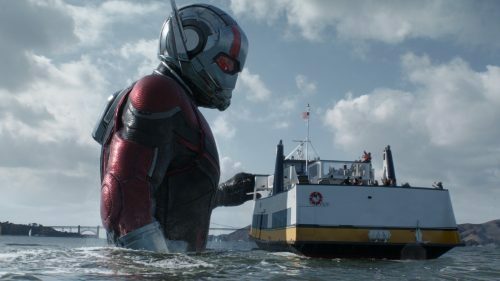 Featuring plenty of nods to MCU current events and more laughs than most standard comedies, Ant-Man and the Wasp is another fantastic addition to the Marvel universe and shows they have no signs of slowing down. Let’s just hope we can all stand the wait until Captain Marvel releases next March! Yes, there are two end credit scenes and the requisite Stan Lee cameo — this one is hilarious — it’s best to keep mum about at least one of the end credit scenes, because it’s a doozy. Which is easy considering it takes place during the end credit scene and there’s another at the very end that’s more hilarious than connective. We MCU fans can rest easy with Ant-Man and the Wasp. It’s a perfect summer movie full of laughs, thrills, and a huge ol’ heart.